Growing up, Philip became interested in copying icons, while adding his vision to a copy. The boy wanted to go to study on Mount Athos, where the monks were located. Subsequently, he will manage to get to this place, where later the famous sculptor considered the talent of a young guy and invited him to St. Petersburg. 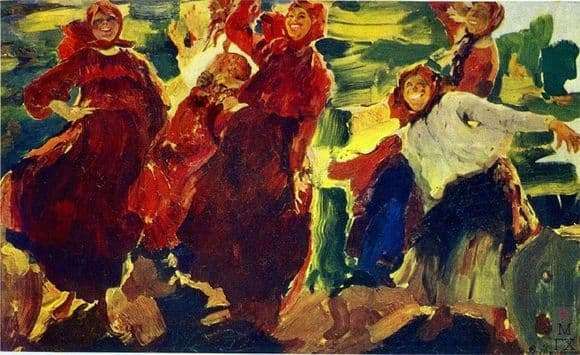 A little later, Malyavin entered the art school, and Repin became one of his mentors. Philip succeeds in obtaining the necessary skills and knowledge that he would later successfully apply in practice, becoming one of the fashion portraitists at the time. As Philip himself said: “The point is not in colors, but in truth.” He argued that the key to successful canvases is to mentally inspect it completely, “embrace” it with a glance, and only then proceed to create. When he presented the public a picture of “Laughter”, which became his graduation work at the Academy, strict viewers really laughed, but at the artist himself. The work was criticized as something disgusting and ineptly portrayed. However, in the future, this work will be sent to Paris for an exhibition of Russian artists, where they will assign it the title of the best picture of the exhibition, and then buy it for a private Italian collection. Thus, the great Russian soul, depicted on the canvas in the face of laughing peasants, left the fatherland, finding recognition among the exquisite connoisseurs of art.